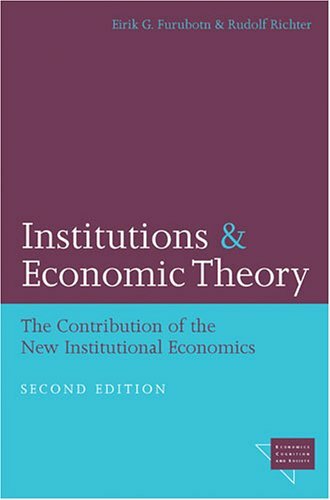 the NIE literature fit into the general fabric of modern institutionalism, and how the new concepts put forward can be applied to institutional analysis. Since the new institutionalist approach contrasts sharply with that of the traditional neoclassical model, special attention is given to elucidating the points of difference between the two. And, along these lines, a final chapter deals with the troubling question of whether neoinstitutionalist theory can be advanced by efforts to extend or generalize neoclassical theory. The book will be essential reading for economists attracted to the NIE approach. In addition, scholars from such disciplines as political science, sociology, and law will find the work useful as the NIE continues to gain wide academic acceptance. Eirik G. Furubotn is currently serving as Research Associate, University of Texas at Arlington; he recently retired as James L. West Professor of Economics, Texas A&M University. Rudolf Richter is Professor of Economics, Centerfor the Study of the New Institutional Economics, University of Saarlandes.